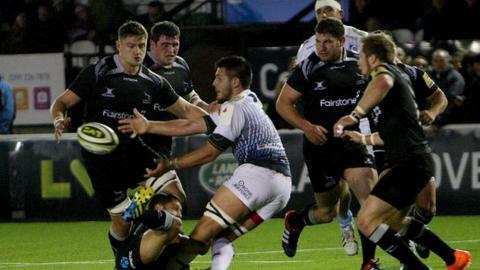 Cardiff Blues were the only Welsh region to win in the LV Cup with a narrow 22-21 victory at Newcastle Falcons. Scarlets lost 24-7 at home to Northampton Saints, with Steffan Evans scoring the home side's only try. Ospreys also suffered defeat on their return to the Gnoll in Neath for the first time in nine years. South African prop Brok Harris made his debut for the Dragons, who had led 21-8 the interval with tries from Jonathan Evans and James Thomas. Debutant Harry Davies, Tom Davies and Rory Watts-Jones were the try scorers for the Blues, who had trailed 21-7 at the interval.